Malaysians love their three layer teas! It does not only taste amazing but looks amazing and unique too. Today will be teaching you how to make and amazing lathering bar which will look just like your favorite tea. The lathering bar uses Soaplab’s handmade opaque white soap base. It provided the lather and also hydrates the skin and keeps it moisturized while acting as a cleanser. Next we added oatmeal, milk and honey fragrance oil for a sweet and appetising smell. Finally, add sparkle gold and black iron oxide mica with transparent soap pieces which are coated with sparkle silver mica. These will replicate the three different layers of the tea. Have fun. Its defiantely a great gift for someone who loves their three layer tea! 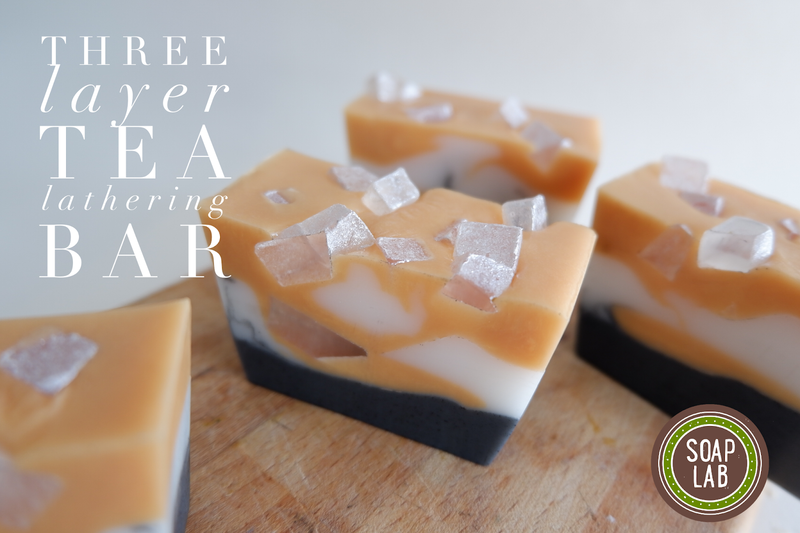 Using a kitchen knife, cut SoapLab’s Opaque White Soap Base into small cubes. The smaller the cube, the faster it will melt. Place cubes into a heat resistant container and melt at 30 seconds interval. Check on soap constantly to avoid soap from getting burn. Once melted, using a pipette (optional) , add in Oatmeal, Milk & Honey Fragrance Oil into the melted soap. Add in Black Iron Oxide that has been diluted with glycerin into the mixing container & mix. Pour soap mixture into a mold that has been sprayed with some rubbing alcohol. Set aside so harden slightly. Repeat steps 1 to 3. Next, pour into the mold carefully & leave it again to harden slightly. Again, repeat steps 1 to 3. Add in Sparkle Gold Mica that has been diluted with some glycerin. Mix using a spatula. Pour soap mixture into the mold carefully. Spray with some rubbing alcohol to remove bubbles. Add in some “ice cubes”. In this case, some cube transparent soap base coated with Sparkle Silver Mica. Then, leave soap to harden for 12 hours. Once ready, remove soap from the mold carefully. Using a soap cutter or a normal kitchen knife, cut soap according to your desired size.